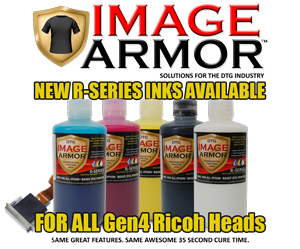 Image Armor is excited to announce the release of the new R-Series DTG Inks for all Ricoh GEN4 printheads. The R-Series inks work great with Anajet mPower series prints as well as M&R M-Link (that uses the GEN4 printheads). Since these printers are generally faster than other printers on the market due to the higher output of the actual printhead, one of the biggest hold backs with standard inks will be the cure times. Standard inks used take 90 to 180 seconds to cure the white ink (1.5-3 minutes). The printer can often times print faster than you can cure with a standard heat press. This is a major problem for anyone pushing numbers through their shop. 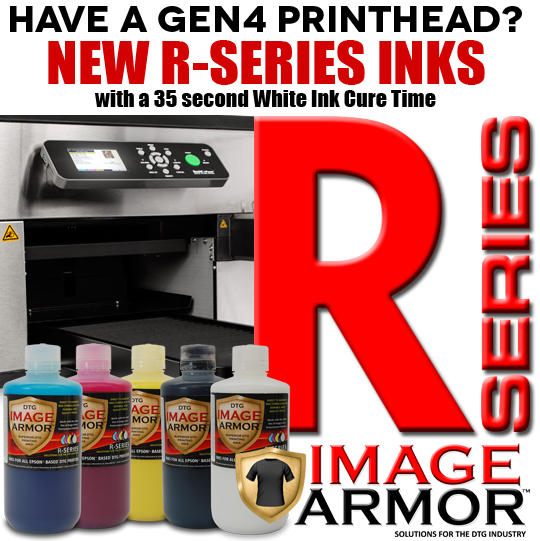 With a 35 second cure time of the new R-Series Image Armor inks you can now keep up with your DTG printer. No more waiting around. The bottleneck now becomes the printer – not curing the ink. Combine the speed of these printers with the new RTP Apparel shirts that require NO pretreating and you’re off and running in a major productivity enhanced environment. Increased throughput, cost per print, and overall quality make the new R-Series inks a great addition to your shop. 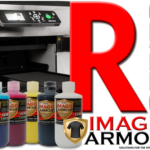 Find out more by talking to a dealer that carries the new R-Series Inks. 35 second white ink cure time – save time and make more money. More productivity during printing and curing. Cost effective pricing in comparison to other DTG inks. The biggest features DTG owners of Ricoh based print heads will find attractive is the 35 second white ink cure time. Ricoh Gen 4 heads can print faster than re-purposed Epson printers. The faster 35 second cure time helps improve production throughput when using a standard heat press to cure the inks. 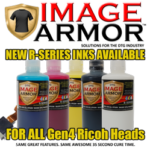 The new R-Series DTG inks can be found by contacting one of our dealers that carry both the Image Armor Inks and Pretreatments.